How does OCU and ReCharge work together on my store if I don't enable the integration? The integration only works with Stripe merchant processing. IMPORTANT: In order for the integration to work you need to use the same exact Stripe account for both apps. Test orders (orders made using a Test card) will not work. Only live credit cards can be used for testing purposes. Option 1: You can offer OCU post-purchase upsells when a customer purchases a ReCharge subscription product. Option 2: You can offer ReCharge "One-time & Subscription" products as OCU post-purchase upsells/downsells. 1. Make sure that you have both OCU and ReCharge apps installed and active. 4. Once successfully connected, you will be taken back to the OCU app's Integrations section. Click the switcher to enable the integration in OCU and you're all set! 1. Your customers will be presented with the OCU checkout when purchasing any store product(s) that have an OCU upsell tag applied AND have chosen a ReCharge subscription option for that product. 2. After completing payment for this initial subscription order, the customer will be presented with the OCU post purchase one-click upsells afterwards. These will be OTOs (one-time-offers). 3. The ReCharge subscription portion of the order will show up in the ReCharge app's Orders section once the OCU thank you page is reached or after 10 minutes if the customer abandons the post-purchase flow. 1. 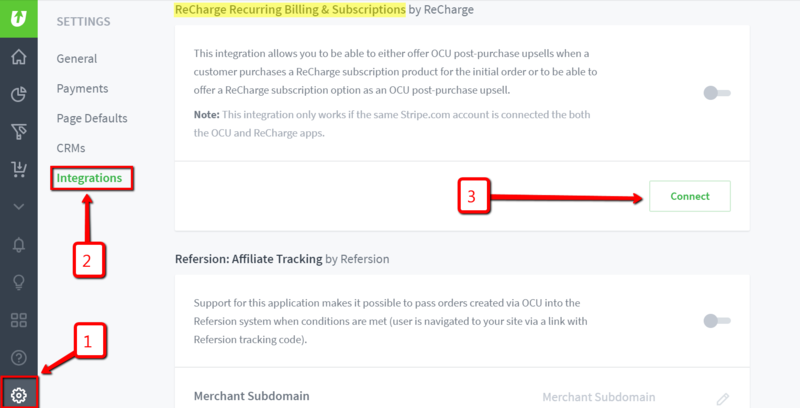 When you add a store product to an OCU upsell tag's funnel that also has a ReCharge subscription option, your customer will automatically be presented with the ReCharge subscription option directly on the OCU post-purchase offer page. Note: The original store product should be added within the upsell funnel, not the ReCharge product which is hidden from the Online Store sales channel. 2. The product within the Ruleset in ReCharge can be configured for either "One-time & Subscription" or "Subscription only". 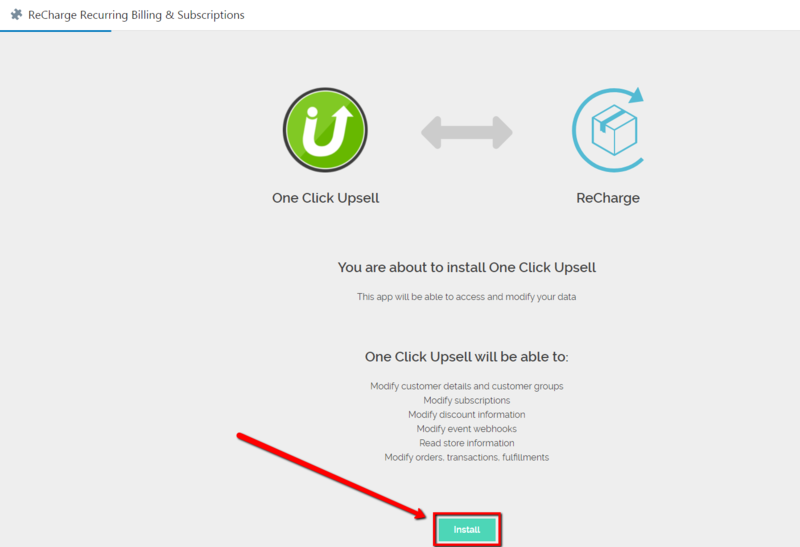 If "One-time & Subscription" is chosen for the product in the ReCharge Ruleset, then both OTO (one-time-offer) and Subscription options will be presented to the customer on the upsell offer page. 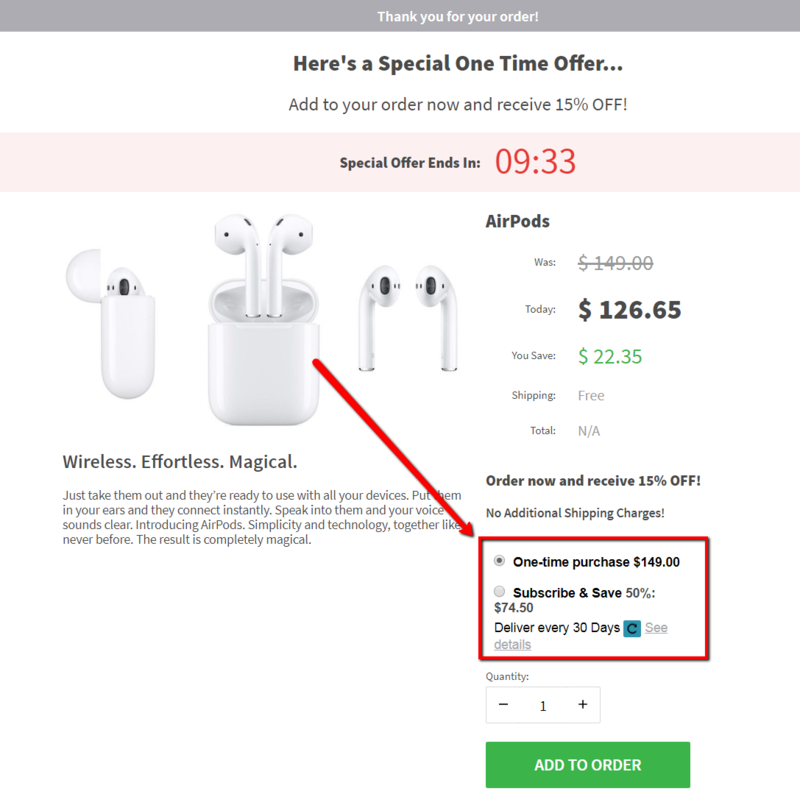 If "Subscription only" is chosen for the product in the ReCharge Ruleset, then only the Subscription information will be presented to the customer on the upsell offer page. Important Note: The Discount added to the upsell product's offer page within the OCU app will also be applied to the subscription "Subscribe & Save" price within the ReCharge app. For example, in the first screenshot above, the "Subscribe & Save 50%" price would be reduced by the additional discount level of the 15% that was added to the offer page product in OCU. This total discount amount would apply for all recurring subscription orders as well. • The integration only works with Stripe merchant processing. 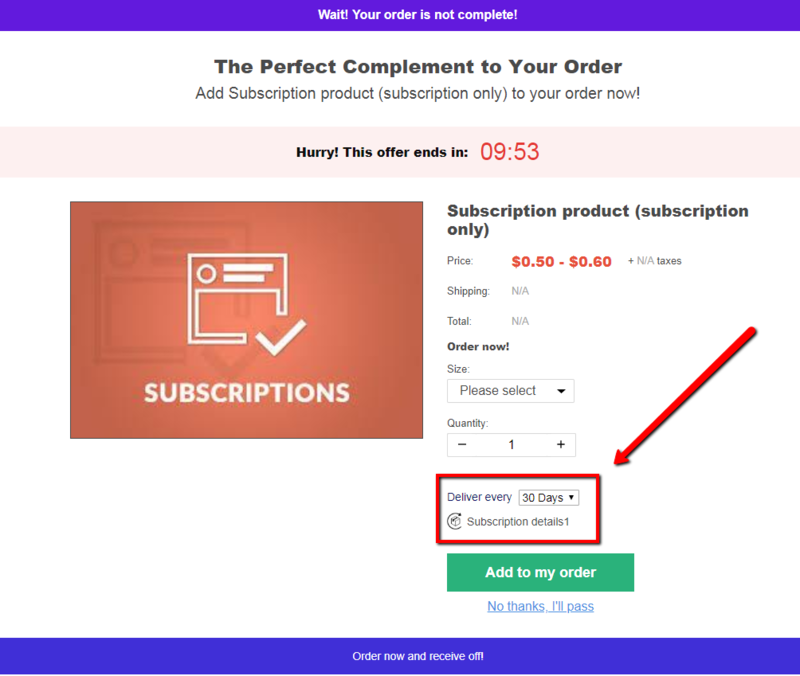 • Orders for the subscription will appear in your ReCharge account once the OCU thank you page is reached or after 10 minutes if the customer abandons the post-purchase flow. • For the ReCharge Customer portal - the ReCharge admin won't show the original order by the customer that didn't go through ReCharge checkout. • ReCharge discounts don't work on OCU checkout - we'll be working on adding this in a future update of the integration. • Shipping / Taxes calculated by 3rd party system could be slightly off in edge cases - The Shipping rate for second item shipped (recurring order item) could be cheaper when shipped in a month (or whenever the next shipment of the subscription item is set to ship) because ReCharge will use the cheapest shipping option at the time of shipping. • At this time the integration isn't compatible with ReCharge workflows or prepaid subscriptions - i.e: pay $100 now and we send you the subscription item for 4 months. We'll be working on adding this in a future update of the integration. • Initial subscription tags won't be inputted for customer/orders for people created by OCU, just future tags on future orders. This may be an issue with your fulfillment system relies on a ReCharge tag being passed to it. Note: All orders which contain ReCharge subscription product will be tagged with a "Subscription" tag. When a hidden ReCharge subscription product is present in the Cart, then the PayPal payment method will be hidden on OCU checkout. When the initial checkout has no subscription product, but a subscription product is offered as an upsell/downsell and the order is placed through PayPal, then the subscription option will be unavailable (only one-time purchase) on the offer page. The ReCharge checkout would take priority if a customer's cart contains a subscription product and the integration is not enabled.